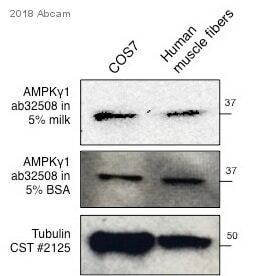 ab32508 recognises 5’-AMP-activated protein kinase (AMPK). Synthetic peptide within Human AMPK gamma 1 aa 300-400 (C terminal). The exact sequence is proprietary. Our Abpromise guarantee covers the use of ab32508 in the following tested applications. Is unsuitable for ICC or IHC. AMP/ATP-binding subunit of AMP-activated protein kinase (AMPK), an energy sensor protein kinase that plays a key role in regulating cellular energy metabolism. In response to reduction of intracellular ATP levels, AMPK activates energy-producing pathways and inhibits energy-consuming processes: inhibits protein, carbohydrate and lipid biosynthesis, as well as cell growth and proliferation. AMPK acts via direct phosphorylation of metabolic enzymes, and by longer-term effects via phosphorylation of transcription regulators. Also acts as a regulator of cellular polarity by remodeling the actin cytoskeleton; probably by indirectly activating myosin. Gamma non-catalytic subunit mediates binding to AMP, ADP and ATP, leading to activate or inhibit AMPK: AMP-binding results in allosteric activation of alpha catalytic subunit (PRKAA1 or PRKAA2) both by inducing phosphorylation and preventing dephosphorylation of catalytic subunits. ADP also stimulates phosphorylation, without stimulating already phosphorylated catalytic subunit. ATP promotes dephosphorylation of catalytic subunit, rendering the AMPK enzyme inactive. Belongs to the 5'-AMP-activated protein kinase gamma subunit family. The CBS domains mediate binding to AMP, ADP and ATP. 2 sites bind either AMP or ATP, whereas a third site contains a tightly bound AMP that does not exchange. Under physiological conditions AMPK mainly exists in its inactive form in complex with ATP, which is much more abundant than AMP. Phosphorylated by ULK1 and ULK2; leading to negatively regulate AMPK activity and suggesting the existence of a regulatory feedback loop between ULK1, ULK2 and AMPK. 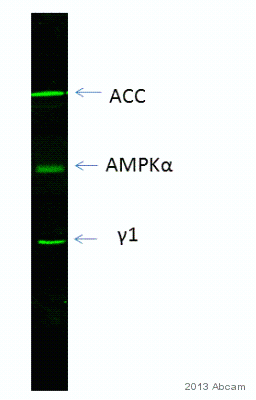 AMPK gamma 1 was immunoprecipitated using 0.5mg Jurkat whole cell extract, 10ug of Rabbit monoclonal [Y308] to AMPK gamma 1and 50µl of protein G magnetic beads (lane 1). 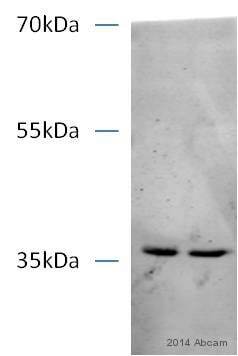 The antibody was incubated with the Protein G beads for 10min under agitation. No antibody was added to the control (lane 2). Jurkat whole cell extractdiluted in RIPA buffer was added to each sample and incubated for 10min under agitation. 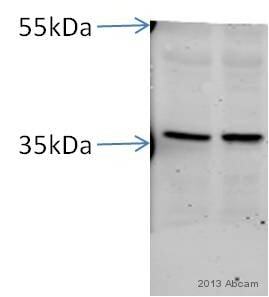 Proteins were eluted by addition of 40µl SDS loading buffer and incubated for 10min at 70oC; 10µl of each sample was separated on a SDS PAGE gel, transferred to a nitrocellulose membrane, blocked with 5% BSA and probed with ab32508. Secondary: Mouse monoclonal [SB62a] Secondary Antibody to Rabbit IgG light chain (HRP) (ab99697). Bands: 37kDa: AMPK gamma 1. Publishing research using ab32508? Please let us know so that we can cite the reference in this datasheet.